Hello everyone! Finally gonna blog about something a little more interesting! hehehe. I hope you guys had a great Halloween cause I sure did even though it got a little too scary for me at times. My hero for the night. Fai really took good care of me even though I could get pretty annoying- getting scared at almost anything around. hahaha. Xavier, what would we do without you? 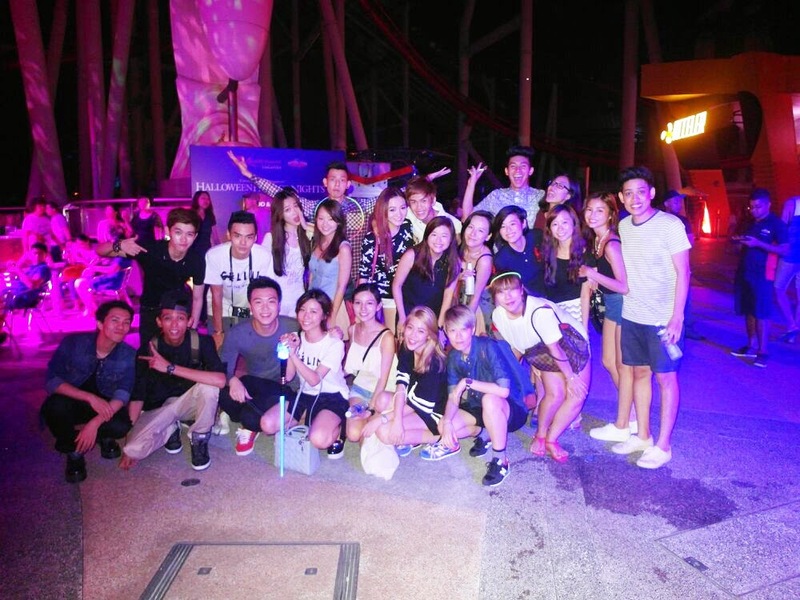 Ridhwan, he made every guy present that night feel like a man. HAHAHA. Super hilarious having him around. We visited "Adrift" first. 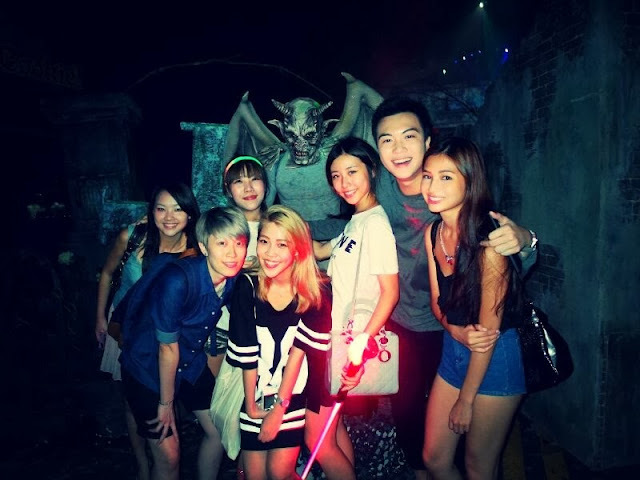 Personally, I think that it was the scariest haunted house at USS this year. Its basically about an old abandoned haunted ship, so you can expect lots of wandering angry souls and dead gruesome bodies around. The Vampire scare zone wasn't anything I'd expected. I thought we would be seeing the modern day sorta vampires, you know, those in biker jackets and stuff. But no... they were dressed mostly in that Victorian era sorta clothing which already gives me the chills on their own. The scare actors were freaking awesome. I had this one actress chasing me around, I freaked out and ran around like mad. Even Fai couldn't keep up. HAHA. Fai holding me the entire time. HAHA... Until I started running away on my own. I absolutely LOVE the make up! Tried to replicate it the next day at Zouk, I kinda made it I guess? hahaha. Oh yes, proud to say that the very next morning, I got to meet the Vampires' make up artist!! So much coincidence, such a small small world. After what seemed to be forever (since I was so scared), we were finally out of the Vampires scare zone. On to the next one!! Thank you to my lovely Fai for taking care of me. Just look at how sweaty I look already. I don't know what got into me but my courage level just dropped all the way down to zero that night. After the first haunted house and just two scare zones, I was certain that I didn't wanna enter the next haunted house anymore. It was the "Songs Of Death" trail, featuring the Chinese opera singer. The moment we entered the trail, I freaked out at the sight of the opera singer dancing on stage. And within a minute, I left. HAHA. I told Fai to go on without me and was left outside waiting for everyone. HAHAHA. Yeah I felt like a loser, but theres just no way I am gonna visit an Asian ghost trail. I mean things like these exist in our real world, literally. I just don't wanna get paranoid the next Hungry Ghost Festival. HAHA. The night ended well with us chomping away on our Turkey legs! Yum yums! Pretty pricey but really worth it! Ending this post with a picture of ALL of us present that day. Note: this is only about 1/4 of the entire GC family. Wish that everyone could be present one day, imagine how huge the picture would be! If you're contemplating on whether to head down or not, just go ahead! I know many people have probably said that the Halloween Horror Nights was better last year and all, but it doesn't matter! Its still really enjoyable and its a great way to bond with your friends and family. Finally got to party after really long. It was very much needed since I've been so stressed lately with filming and school. The best thing about partying yesterday night was that I didn't have to care about how I look at all!!!! Whooo-hooooo! Laraine joined us in her Pocahontas costume after a while and she looked so pretty!! She even baked us cupcakes. HAHA. They were suppose to be Halloween inspired but failed of course. My insta post that really scared a few of my followers. hehehe. The fangs was extremely uncomfortable so I was constantly taking them off. And that's it guys!! Happy Halloween! Finally got to be a vampire for once in my life. People actually couldn't recognize me at all! I'd bumped into Francesca outside Zouk but she didn't even know it was me at all until like 5 seconds later. I LOVE this watercolor spag top. Its so gorgeous isn't it? I love how I can feel so comfortable yet pretty in such a simple basic top. It looks good just paired with a pair of denim shorts. Perfect for any activity under the sun. Next, I'd picked this wrap bustier bralet! It really looks like it was picked out from a NastyGal store. I love how well it fits me and how versatile it is. Pair it with a pair of bandage skirt or sequin shorts and you're all ready to party. Or dress it down with a maxi skirt or denim shorts for a day look. 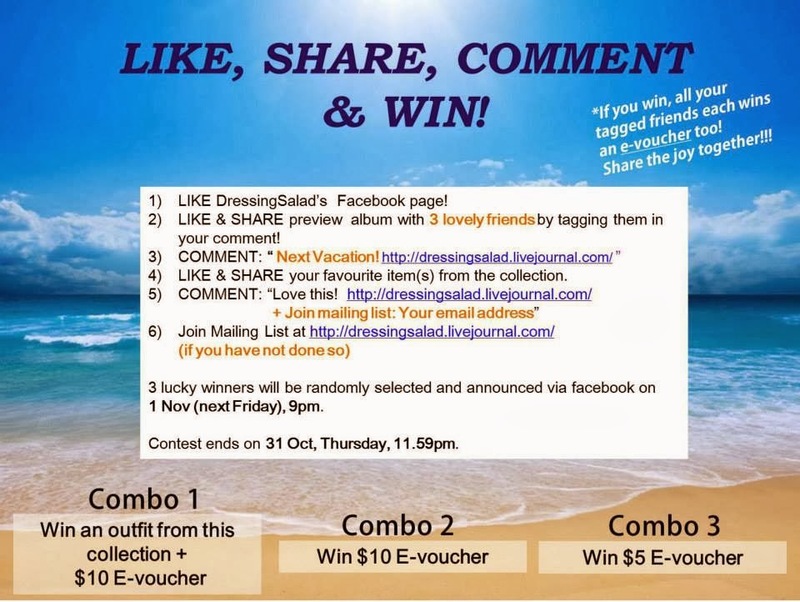 Like Dressing Salad on Facebook and follow them on Instagram for more updates! Also, join their contest to win some awesome vouchers! Finally have the time to share with you guys my picks for Vogue Avenue's new collection coming your way on 28th Oct 2013! Look out for really awesome apparels as always. Like I've mentioned before, Vogue Avenue never fails to bring in really unique pieces that can't be found anywhere else. Sure you've seen this dress before, but have you seen one in such a stunning electric blue?!?! The moment I put this on, I just had to have it! The color really compliments our skin tone and everyone knows that I LOVE halter dresses or tops! This is one of my favorite dresses of ALL TIME. Next, I went for a color I hardly wear. This redish-maroon studded top. Firstly, I love the cut in detail and the color is just beautiful. Its really comfortable and looks great on its own! Perfect for any occasion.